this verse he is expressing his belief of what he imagines the world to be and how doubt him. He hopes that more people will join him in his journey to world peace. He talks about people all joining together as one, no one is better than anyone else we were all born united and equal. No man with a lot of wealth would be better than a poor man. 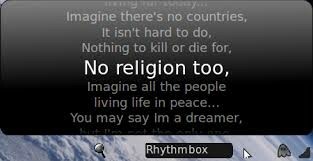 John is expressing that everyone should be able to dream and also expressing that the world should be united.